It became a minor phenomenon during 2007. By September 2009 it was a virus out of control. Described in Wired as a “popular internet meme” (Wortham, 2008), the obsessive serial mash-up of a key sequence from Oliver Hirschbiegel’s 2004 film of the last days of Adolf Hitler, Der Untergang (The Downfall), is suggestive of the cultural logic of the contemporary formation known as remix. Remix culture is comprised of what could loosely be termed amateurs and professionals engaged in the practice of creatively re-using found material. The distinction is useful in identifying the aesthetic and material differences between dedicated intermedia remix artists (Negativland, Martin Arnold, Craig Baldwin, Soda_Jerk), artists who incorporate elements of remix into a broader audiovisual practice (Philip Brophy, Candice Breitz, Christian Marclay, John Zorn) and the vernacular audio-visual mash-up/remake/dub/scratch aesthetics associated with a broad range of online practices. The domestication of audio-visual literacies in the digital age has meant that the processes of sampling, editing and compositing — once the province of dedicated adepts — have become second nature for a generation weaned on computers and digital technology. Audio-visual remix attests to a utilitarian competence in “writing” for the communications paradigm of the internet and networked conditions that Gregory L. Ulmer famously termed “electracy”; a concept that prioritises the notion of the “remake” and the use of found material (Ulmer, 1989, 1994, 2005, Tofts, 1996). As well, this pervasive cultural competence (in Chomsky’s linguistic sense of the term) attests to the dramatic distribution of the material means of production into the hands of consumers. Dan Angeloro has suggested, we are witnessing a “popular movement of incredible momentum — the copy/cut/paste logic of contemporary internet cultur”? (Angeloro, 2006: 20). How can you be found when no-one knows that you are missing? The Fibreculture Journal is affiliated with the Open Humanities Press. 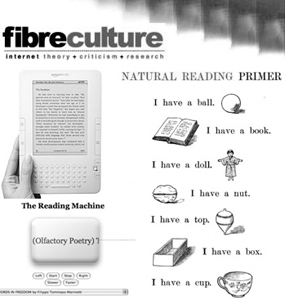 The Fibreculture Journal is a peer reviewed international journal that encourages critical and speculative interventions in the debate and discussions concerning information and communication technologies and their policy frameworks, network cultures and their informational logic, new media forms and their deployment, and the possibilities of socio-technical invention and sustainability. The Fibreculture Journal encourages submissions that extend research into critical and investigative networked theories, knowledges and practices.